I have a new, colossal Food Network crush on Secrets of a Restaurant Chef and the first time I saw the show, I completely forgot every food personal crush that had come before. “Ina Garten who?” “Michael Chiarello? I never heard of him.” Because seriously, Anne Burell trumps all that came before. She’s got the kind of real cooking and fresh ideas you’d hope for from a television show, but too rarely get. I immediately want to make everything she does. And if I saw chicken milanese on a restaurant menu, I wouldn’t order it. If you told me you were breading and frying chicken cutlets for dinner, I’d feign excitement but inwardly groan. Because if there are two foods in the world that will never hold my interest, they’d be chicken cutlets and anything that has been dredged in breadcrumbs and fried. I find the former bland and the latter makes everything taste the same, not that I need to learn how to form an opinion or anything. Yet, when Ms. Burell made it, I counted down the days until I could find an excuse to make it, which brings us to Tuesday night’s inauguration dinner party (where the caramel sauce was homemade, ahem, but that story for a different day). What made the dish, though, was the pairing: a fresh escarole salad, tossed with ground hazelnuts and romano cheese and pickled red onions, a dreamy plate-filler for people like me, who deeply dislike when breaded, fried foods are served with rich, warm sides. I like balance. This meal didn’t feel heavy at all. Er, I mean, until we got to the caramel sauce. But that’s not my new crush’s fault. Whoa: So, I know that I just mentioned that Smitten Kitchen had been nominated for a Well Fed Blog Award, and I don’t mean to overly nudge, but it was only a few hours later that I saw that this here little site had also been nominated for three Bloggies — Best Food Blog, Best Photography of a Weblog and Best Designed Weblog (which especially flatters me, because I designed this site myself and I have zero Web design training). [Thud.] I try to be chill about stuff, allow things to happen organically and all but three? No longer chill. Voting is open until February 2. Don’t make me bribe you all with cookies. If you make nothing else, just make the salad. The salad has made me fall head over heels in love with escarole; I am rapidly making up for lost time with it. But really, you should make all of it. This dish is a perfect pairing and every guest cleaned their plate. A note on doubling the recipe (as we did): I found I had way more battering station stuff than I needed for a doubled recipe. I know that a certain amount of extra is necessary to be able to generously dip the chicken, but when doubled, I ended up throwing way too much away to be comfortable with. Try 1.5-ing the egg batter, flour and bread crumb mixture instead, and see if it is enough. You can always add more. Make the escarole salad: Combine the romano, hazelnuts and parsley in the food processor and pulse until they are coarsely chopped. Toss together the escarole, hazelnut mixture and some of the pickled red onions and dress with some of the pickling liquid and olive oil. Season with salt and pepper. Place chicken on each serving plate and top with the escarole salad. * Tiny kitchen tip! My makeshift setup since I don’t have one of those mallet things was to lay the breasts out on a cutting board, cover them with plastic and thwack away at them with a small, heavy saucepan. It worked great! And I had one less gadget to buy. The salad sounds amazing. However, in spite of frying making everything taste the same, it also makes everything taste crispy, fatty, and delicious. Isn’t that at least one argument in its favor? I make a similar dish but with arugula instead of escarole and it’s one of my favorites. I’ll definitely have to try this recipe for pickled onions though, sounds wonderful! I saw that episode too–I’ve been dying to make that salad. I love the idea of the hazelnuts. Advise please want you to win!!!! Chicken Milanese is one of my favorite dishes to make at home. Mine is a little different…I make fresh bread crumbs, skip the dredging in flour and just dip in eggs. Fry in a combination of butter and olive oil, and you can’t forget to squeeze fresh lemon wedges on top before eating. yummy! Lots of new things to try with this one. I’ve yet to have the pleasure of escarole. The pickled onions sound delish – those would be great in the summertime with fresh onions. Looking forward to giving this one a try – love the ground hazelnut addition too. Yum! And the fact that there’s a salad WITH the fried chicken… brilliant. Oooh pretty pretty chicken! 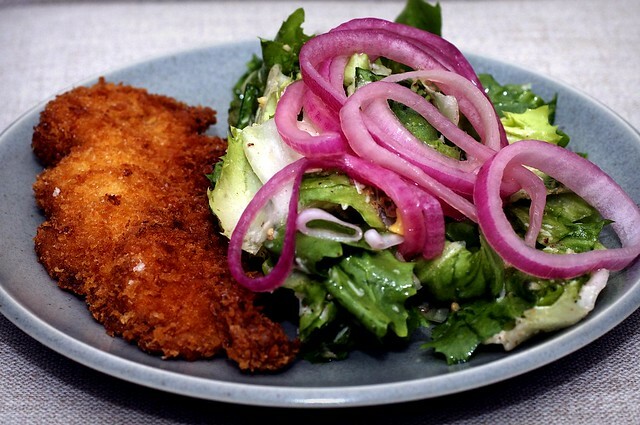 I hear you on the blandness thing of fried cutlets, but done well sometimes it can be Just The Thing, especially when paired with a nice fresh salad. Btw we have the same food crushes :). Michael Chiarello is soooo cheesy but I secretly want him to carry me over the threshold of his big old Napa house. Le swoon. Actually that is one of those Food Network shows that gives me a headache. I love the food she cooks but her personality or voices that she uses drives me insane. I will continue to catch the show when I can and hopefully she will grow on me. This is something I go through and usually overcome it …..except with Rachel Ray. Seriously, the yummo and the shout talking just put me off every time. Anyway, I too made this chicken and salad the other night. So fabulous for a fried chicken cutlet. This looks fabulous – I will be trying it next week! So, I always love some good fried food and think myself fairly well rounded in the kitchen department (maybe from the fried food) but I must ask a rather sophomoric question…. what is escarole? I don’t mean to sound like a dolt who has never visited a good farmers market or produce isle but well, I don’t know what that is. Details? So are you saying if we hold out on voting you WILL bribe us all with cookies? That would be awesome. That chicken sounds easy and delicious! I will definitely have to try. Real cooking…fresh ideas…wanting to make everything she does…apparently, you’re my food blogger crush. I’m happy to find out that I am not alone in my Anne crush. Chicken Milanese is almost identical to a favorite dish of mine with Japanese/Hawaiian origins – Chicken Katsu. 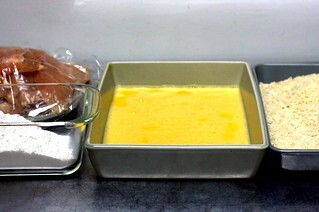 Both are breaded in panko and fried, though I use canola oil and season the breasts beforehand. The chicken is then cut into stripes and served with a dipping sauce called tonkatsu. It is amazingly delicious and usually served with buttered white rice. Delicious! I absolutely adore Anne Burrell. She’s so excited about everything. And when I’m making something I know will be good, I often act the same way- some version of a yummy, happy dance and halfway shouting “Yess! Mmmm!” while pumping my arms. Who can help it?! In fact, when I saw “chicken milanese” as your headline I thought “Oh, I have an episode of Secrets of a Restaurant Chef tivoed where she makes that!” so I clearly must watch it now on the basis of your recommendation. In your chicken milanese instructions, you say to add butter after the olive oil has reached medium-high heat. How much butter??? No butter. Her original recipe called for 1 tablespoon in the frying oil. Although I am sure the flavor would be nice, I can’t imagine it would come through with more than a cup of oil in the pan and skipped it. Now edited out. Escarole is a green in the endive family. It can be used cooked or raw. It has a slightly bitter flavor, and is a bit sturdier than most lettuces, but not by much. It looks like this. Voted! :) That salad does sound amazing. I love red onions. I’ve never had them picked before though. They look great. Oh God! I, too, am in LOVE with Anne Burell. LOVE LOVE LOVE. She’s genius–so accessible, so fun, so talented. She makes restaurant-quality food seem so easy and doable and awesome. I have the same reaction to every show–MUST. MAKE. NOW. This morning, she did individual grilled pizzas, and I’m already figuring out when I can do the taleggio with puttanesca. Like…tomorrow? Genius. Love. I tried voting…it said the poll no longer exists or has been deactivated. boo. Btw – I voted for you – go DEB!! about Anne Burell – yes yes yes! About ten minutes into the first show I saw I was diving for the remote to set up the dvr to record every show (have never done that with any other show, cooking related or not.) I’m sad that she’s only on once a week, I only discovered her a few weeks ago so there are shows I haven’t seen – I’m ready for reruns already! I have been recording Secrets of a Restaurant Chef, since it first debuted. I am in-love with Anne Burell, too! I have this recipe on my meal plan for the week. I’m so glad that you posted photos of it. Now I know it’s tomorrow’s dinner…fer sher! BTW, I made her braised short ribs and Celery Root and potato puree. Outstanding! You have a beautiful and well written blog and should be proud of all your well-deserved nominations. I may check out the show based on your recommendation. I haven’t been into the FN much lately, except for Ina, of course. Looks like that crush is over for you, though. What do you think could be used instead of hazelnuts? My husbands allergic to them and I haven’t eaten them in so long I can’t remember if the flavor is that big of a deal that we could just skip it or use cashews instead? I also got a disabled response to that first voting link. I’m assuming that is because I already voted when you first mentioned it. It isn’t all that clear that the second voting link is the big one for the annual weblog awards. I figure you can link to it more than once over the next few weeks. So, did you say something about cookies? this all looks lovely! i totally agree with your feelings about fried food but i have to say that your own ina garten’s chicken piccata recipe is just lovely. i think the key is to use good breadcrumbs and half decent olive oil. and where are my cookies? you can bribe me with homemade oreos anytime! Deb, there is a great little Italian restaurant here in SF- Jackson-Fillmore – that once served a chicken cutlet that was to die for. It was in the summertime at the height of tomato season. I havent been back in a while to see if they still make it – probably because I make it at home now. the hot cutlets were placed on top of a simple salad of heirloom tomatoes (meaty not overly pulpy) and red onions – little to no greens as I recall – but dressed with balsamic and oil. Placed on top of the just fried chicken is a thin sliver of blue cheese, which softens from the heat. It was served on one of those oval diner-like dishes you often see in family-style Italian restaurants. Try it sometime, its a keeper! I tried to vote for you too, no luck. Something is wrong with the website. Deb, you’re the best, ever. Can I suggest a beet salad using the recipe for the red onions. Just throw in some sliced, (canned) red beets with the onions and let them marinate together. (I use the cheap supermarket red wine vinegar. It works just fine.) I lift them out of the marinade and toast walnuts in the oven then chop and sprinkle them over the top of my beet salad. Any Russian who likes vinegary food should love it. Oh — and Panko crumbs are KEY to this recipe. In fact any thing you want to come out nice and crunchy and crispy — USE Panko. This looks lovely. Makes me want television! I love red onions. Part II. I tried the link to vote for you again and this time it worked. Re the Beet and Red Onion salad. I don’t use hot sauce in my marinade, but maybe next time I’ll try it. Okay, you now have my 3 votes. I have NO doubt you will be the ONE nominated. Your pictures pop with color and detail, your dialogue is delightful, it is obvious you read all the comments and I always look forward to your next installment. You can send the rugelach pinwheels to…… Incidentally, I do NOT intend to share with my family…maybe 1 or 2 each but that is it! Oh, how I miss Food Network! I thought maybe I’d at least get some Nigella, but the British chefs on TV are a little rough around the edges to say the least. That chicken looks delicious and thank you for pickling the onions. I hate undressed fresh onions in a salad! I’m voting for you, but I won’t refuse a bribe for cookies! Hmm, I saw that tv chef in the lobby of an apt building just around the corner from where I was staying. I wonder if she need to be warned of a potential foodie stalker-alert? Hmm. I have done something very similar to this from an Ina Garten book, I’m sure, only without the pickled onions and with a very sharp, lemony dressing. Sounds delicious! Now I kinda regret having had cookies for lunch, as opposed to something filling and nourishing like this dish. Congrats! My vote’s in for you…good luck! I’ve also done the recipe from Ina’s cookbook. She calls it Chicken Parmesan and was inspired to make it from a meal at a restaurant in Milan. I love it. I watched this show for the first time and saw Anne make the chicken milanese too. She was terrific, a lot of energy and funny! I was instantly hooked. My veal milanese is so similar minus the pickled onions with the addition of arugula & fresh mozzarella. Congrats on your Best Blog nomination! How exciting! What a great combo. The pickled onions and escarole are particularly intriguing. Anne’s show aired right after we moved to a house with no cable TV — no Food Network! I caught one episode of her show at a friend’s house, and she instantly stood out from the others. Glad to come across her show and recipes vicariously through you! Deb, and others, thank you for your wholehearted good thoughts about Anne Burrell and her show. Shortly after her show premiered last summer I was truly shocked at the negative, even vicious comments about her on other food blogs, and I began to feel that I must really be from another planet to have adored her and her show from the git-go. It was really heartening to read comments that reflected my own feelings. And yes, the chicken milanese and red-onion salad are great (though I really like Heather’s variant, above). My DH sacrificed a bit of thumbtip on the new Benriner mandoline we bought for the purpose of making that onion salad, but hey, you can’t make an omelet without breaking some eggs. I saw that on TV too and plan to make it for my husband. It was the first Secrets of a Restaurant Chef show I ever watched. I liked the dessert she made that day too. Yum. I often order chicken milanese at a restaurant. And I like her new show also. I don’t think that I would enjoy chicken milanese as much without the lemon on it, I think that it’s what makes it. The recipe that I always use is from one of Bibba Caggiano’s cook books. I have tried her meatballs and marinara sauce twice and it is so good and easy to make as well. She is amazing with the seasoning but that is what makes her food taste so great. I’ve been thinking about this recipe since I saw it on Burrell’s show – glad to know it worked out. And while I love that show… I don’t think anyone could ever displace Jamie Oliver from my heart(slash-stomach). I haven’t watcher Anne’s show on food network so I looked her up on the website and watched the 4 videos she had. I went into shock/shutdown when I saw her throw 2 HANDFULs of salt into her bolognese sauce. It makes sense now why I always think I’ve eaten at a salt lick when I dine out. just voted for you in all three categories. I totally share your new chef crush. I just made her braised short ribs recipe with great success. Darn, if I’d known you were offering cookies, I might have played the tease just a little before admitting I’d already voted for you. I make something resembling this without the wonderful frying part. I use bone-in skin-on chicken breast, soak it in buttermilk overnight, throw some dried herbs into the romano/crumb mixture, and bake it in my little convection oven. But the flavors are the same, except for the frying bit. My big reason for not frying at home (in a kitchen about as big as yours, with baker’s shelves as the sole counter and shelf space) is my incredibly wimpy exhaust fan, located near the ceiling in the corner across from the stove. Maybe in the summer, when I can stick the box fan in the kitchen window, I’ll give this one a try. I’ve voted, do I get those cookies now?! Good luck. 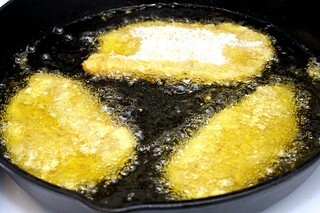 I love breaded chicken but the smell of frying lingering in the air puts me off cooking it too often. I love Anne Burrell too! She is delightful! I’m warming up to Anne Burrell, but I think her verbal ticks will become just as grating as “EVOO” and “yumm-o!” if she keeps repeating them. Chicken Milanese? Gotta make you own crumbs and goose them up with some fresh herbs, S&P, red pepper flakes and parmesan. And MUST be served with lemon. Panko is just wrong. My favorite way to eat chicken, period. The recipe that I have made is more of a saute than a fry method. I think it’s 2T of olive oil and 1 T of butter. I voted. Cookies now please. This look amazing. And because you’re also amazing, I also just went and voted for you for every category you’re in. Good luck!!! I <3 the Smitten Kitchen! Hey, Just wanted to let you know that this is by far my favorite food blog! I’ll look to this site everyday to see what’s cooking :) . My all-time favorite so far are the blueberry crumb bars- de’lish! I voted for you last week, i’m sure you’ll get it! This dish looks delicious but I have to agree with #11 Jenny. Anne gives me a headache also and I get very annoyed by her hand movements. I keep envisioning pieces of food flying around her kitchen and she seems to use an excessive amount of salt. Makes my daughter, hubby and I cringe whenever she adds salt to her recipes again and again. I saw that show too but can’t find the escarole anywhere so I made a different salad. I don’t like watching Anne but she does have some good ideas. I’d watch Ida or Giada or Michael any time. Actually this is something I wouldn’t think to make. But the pickled onions and the perfectly crisp cutlets. I can’t wait to make this. Just looks fabulous. And I will be sure to check out the show. Looks beautiful. I just discovered panko bread crumbs and I love them. I often start salad dressing with a few quick-pickled onions in the bottom; it infuses the dressing with such great flavor. This looks like a killer dinner and congrats on the award nominations! Of course well deserved. I love anything breaded and fried, but rarely do it myself. This does look so good and the salad sounds fantastic! I love this show too! I have been tempted to head out to the grocery store as soon as I’m done watching to make whatever I saw. Your dinner looks so good, I will have to try that escarole salad very soon. I voted for you in all three categories. Not only do you cook and design and photograph well, you have the ‘nads to pose with a plate of chicken milanese near your waistline. Go, you! Congrats on the awards…proof that you’re doing it all right! WOW Deb! Have you outdone yourself here…. No i guess not :) Fabulous though. I love it. Congratulations on your Best food blog – writing award!! Oh you are a woman after my heart…Anne Burrell is definitely the best thing about the Food Network these days. Even my boyfriend, who absolutely hates cooking shows, finds her kind of charming. 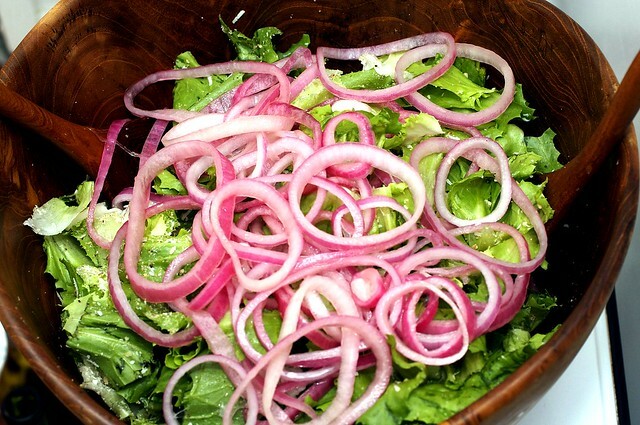 The salad does look great…but then, I eat anything and everything that has to do with pickled onions. I’ve become a huge fan of Anne Burrell too! I have a couple of her shows recorded and have not been able to watch them yet, so perhaps one of them is this one! Oh, and, AHEM – there better be a post forthcoming about that caramel sauce, Deb. I just voted for you too, Deb. While this looks totally delicious (gorgeous photo up there) I can’t chime in on the Anne Burrell love. She annoys the hell out of me with her weird voices and ticks and constant, frenetic movements. The pace of the show is so fast, it’s exhausting. I do agree that the food she makes is much more appealing and sophisticated than the average FN star (ahem, Sandra Lee). But I just can’t get past her persona, sorry. Frying with Extra-virgin Olive Oil? I know it’s a hot debate (pun intended) whether frying with EVOO (I hate that phrase too but it’s easy – darn you Rachel Ray) is healthy or not since it has a lower smoke point than other oils. But it does seem a bit excessive/wasteful to use good EVOO for frying — wouldn’t it be just as good (taste-wise), but cheaper to use regular or virgin Olive Oil? Or healthier and cheaper to use Canola? I prefer not to sacrifice quality for price, but wondering if there’s a happy medium somewhere? BTW — I am love,love, loving your website. You got my votes on the Bloggies. Can’t wait for you to have your own TV show! So we’re the biggest fans of things fried. Food just cannot taste any better. Don’t get us wrong. Healthy is great! But fried is fun too. So this chicken sounds DELISH! And it’s definitely better paired with that salad. We could eat the pickled onions one by one by one…As for frying, we’d definitely use grapeseed oil, not olive. High smoke point, low flavor, same caloric value, just as healthy for you as olive oil. It was a terrific meal. Inauguration dinner party pics at pixxiestails.com! Thanks deb! I have been awful about leaving comments, but you are one of the must reads on my reader feed. Kudos on your noms. Very well-deserved. You’ve got my vote(s). I hope you rock all three categories! I haven’t had cable for a year and a hlaf now, and the main thing I’ve missed is the Food Network! People tell me I can get a little box for local stuff, but if it doesn’t get the Food Network, who really cares? At least I can read all of their recipes online :) Now if they’d just start putting thier shows online that would be fabulous! I’m so excited to see you talk about Ann Burell! I love her recipes too and cook what she does almost every time after the show. Everyone I try to talk to about her has no idea who she is…….YET. Thanks for the validation. I love Anne Burell! She’s my favorite new host on Food Network. I enjoy learning how things really work inside a restaurant kitchen, and everything she makes looks sooo appetizing. I’ve made her short ribs, marinara sauce, scones…I’ll have to add this to my list! I, too, am newly addicted to Secrets of a Restaurant Chef. I wanted your opinion, though, on the amount of salt Ann uses. I LOVE salt, but even I find myself gasping at the amount she puts in most things. Did you make this recipe using the same amount her recipe called for, or did you just adjust to your taste? PS – you OBVI have my votes!!! Yahoo – I saw that episode and have a total crush on her cooking!!! I am a Food Network addict and Anne is one of my favorites. Congrats on your nomination – I am new to your site and love it! I have to agree with Nina about Anne’s verbal ticks. I’m hoping to warm up to her show, though! This recipe looks fabulous! I love things dredged in bread crumbs…am I an outcast now? Kikibibi — Totally not a vegetarian in any way shape, or form. However, I was once a vegetarian, for a very long time (ages 13 to 27, actually). And because of that, my default cooking is still vegetables; meat always seems like a side dish to me and when I make exceptions, like for this dinner, it’s usually less than once a week. Elizabeth — Yes, so. About the salt. First, I felt this dish — the way I did it — was underseasoned, ironically enough. But, I also didn’t have room to lay out all of the chicken pieces and properly season them, which would have helped. Second, Burrell uses a lot of salt. But the thing is, so do most restaurants; most of us always wonder why restaurant food tastes better: it’s largely because they’re better, and more thorough, at seasoning food. (You know, also the cooking skill and good purveyors and stuff…) Nevertheless, at home, you only need to use as much as you are comfortable with, or to taste. The amount that she uses has little do with how much you’ll enjoy her dishes at home, seasoned as you like. Last point, or the kicker: We had dinner at Centro Vinoteca last month (and dude, Giada was at the next table! ), which is/was Anne’s restaurant until she quit a few months ago because her show and whatnot were keeping her too busy. And guess what? I felt that two of my dishes were over-salted. And I love salt. The End. Learned about your site from Pioneerwoman.com. She graciously listed all the competitors sites she’s up against in the blog award contest & recommended we visit them. So glad she recommended you, can’t wait to prowl through your archives & pictures! I’ve already learned why my attempts at frying chicken have been such failures, refrigerate after dredging. Who knew! Already you’re my hero. I also have become a real fan of Anne, or as I call her Gal Fieri (it’s a hair thing). Her Pasta Bolognese is also incredible. I also love Burrell’s show. Not only are her recipes fantastic, I like that she explains why certain steps and ingredients are necessary. She’s not just teaching how to cook one thing, she’s teaching the secrets behind all kinds of cooking. This chicken looks perfectly crispy! I love making this with a pasta alfredo side too…haven’t tried the salad and haven’t eaten escarole like this yet (to my knowledge) but I’m pumped to try it! I have to agree with some of the other comments that while I think Anne Burrell’s food looks absolutely fantastic, I’m not sure she’s cut out to be a tv show host. Don’t get me wrong, she’s a fabulous cook and I want to make all of her recipes, but she seems a bit tight and nervous on the camera and I haven’t really been able to get into it. That salad, however, looks divine. Please tell us. Is Giada’s head really that big? This is cool! It looks delish! I actually got to meet and have my photo taken with Anne Burrell when we were in New York last June and stopped for an afternoon glass of wine at her new restaurant, Vino Enotecca. I have the photo on my blog to prove it! At the time we didn’t know anything about her new TV show, but I already new her as Mario’s sous chef on Iron Chef America and from reading the Food & Dining section of the New York Times. I have her new show TiVoed. I made this recipe the same day I watched the TV program. I loved every bite of it. I voted for you, I hope you win. Hi, first time commenter. I’m confused, though I probably shouldn’t be. Is Deb vegetarian or not? I thought she said she was in a previous post but then did this chicken up. Or maybe she just cooks it all? Just curious. Gorgeous photos and lovely recipes– I will be back! Not a vegetarian. I actually answered this in comment 97… not sure why it such a huge concern. I mentioned in the mushroom post that when I had been one (years ago) I felt that what people liked about meat was not the meat itself but what was done to it. Unlike vegetables. People generally just like vegetables. Anyway, perhaps that was confusing. There are, however, a few dozen meat recipes on this site and probably a hundred more than use meat-based ingredients. Just adding my two cents, epicurious-style! Not that I totally deviated from the recipe and then rated it. I deviated a little. Felt no need to let chilled the breaded breasts, and it was no problem. Used 1/2 olive oil, 1/2 canola. Only had parmesan so used it for the salad too. HATE hazelnuts, used pecans. BIG HIT WITH FAMILY! a friend of mine made this for us over the holidays…LOVE it. one thing she did was let the chicken soak in milk for several hours before she prepared it. to keep it from drying out. is that something that is done often? i’m so glad to have a recipe for it now i can’t wait to try it again! Well I am officially starving now! You never fail to hit one out of the ballpark. Even if it is fried chicken cutlets! quick question, deb. i have lots of shallots but no red onions in the house, and i want to make this salad soon. can i pickle the shallots or should i pick up red onion instead? I made this with several modifications (due to what I had on hand) last night and it was a big hit. Thanks for sharing. We loved the combination of textures and flavors!! I’ll definitely make it again!! Alex — I am sure shallots would taste wonderful in there. but the pickled red onions were a triumph, and the chickenm great! I saw that show too, just loved it, and made the chicken that week. It was delicious!! And I think letting the chicken rest for a while in the fridge once it is breaded, is a fabulous idea. The chicken was crispy on the outside and juicy on the inside. i made the salad last night for a non-superbowl party and it was SO GOOD. the salad dish was scraped clean and i made a big salad for 6 people. we had it with homemade mac n cheese. delicious! thank you for the great recipe. The whole thing, again, is THE BOMB. But the salad is monster. The family requests the pickled onions in any salad now. Salad without it is SAD salad. YOU KILL! YOU ROCK! You are the Bruce Springsteen of food, my darling! Funny, I had just made chicken cutlets the night I saw this. I find that dredging the chicken in flour causes the coating to sort of bubble and separate from the meat. My Italian mommy always did it with just egg and breadcrumbs (and so does my hero, Marcella.) Deb, do you think it’s better with the flour? I am no expert on breading and frying things, but this technique worked fantastically. There was no separation. I think letting the coating set in helps. Another fantastic meal! I am addicted to this salad. I have made it three times since you posted it. My husband (not a fan of bitter greens) loves the meal. Thanks Deb! Thank you so much for this meal! I’m a relative newbie when it comes to cooking, but I’ve had success with your apple cake, sausage soup and even the onion tart. This was my first time frying, first time pickling, and first time using escarole. My husband and I loved it. Love trying new things, and love taking new cooking steps with your recipes. This was my favorite Deb meal ever, with the exception of the chicken pot pie… MAYBE. I made the salad for friends. Everyone loved it except that it was WAY too salty so I made the onions again and used only 1 tsp of salt and that was very good. Onions great on sandwiches too. I could not agree more on your assessment of Anne Burrell! Just as my love affair with Food Network was waning, I caught her show on a recent Saturday by happy accident and now I just can’t get enough. That being said, I haven’t actually tried any of her recipes yet….but now I am inspired. Thanks! I can’t wait to try the pickled onions here! Also, looking for a similarly quick pickled red cabbage recipe. Suggestions? Being led here from the bbq brisket recipe, I made these recipes tonight for dinner (brisket tomorrow!!). My son (6 y.o.) proclaimed upon his first bite of the chicken milanese, “This is better than the fried chicken at Woodman’s!”. If you are at all familiar with the North Shore of Massachusetts, you will know that Woodman’s in Ipswich is a fried food mecca (the clams being their real claim to fame). So naturally, I took this as high praise from the chicken tender aficinado in our house. Oh, and the salad with pickled onions got raves from the DH. Total WIN! How long do pickled onions keep for? I made this salad again last night! The leftover onions are still in the fridge. In an airtight container, I’d consider them safe for about a week. If they seem off, which can happen if the onions were less fresh or crisp, after a few days, however, don’t hesitate to chuck them. I’m eating them right now! (Made the recipe again this week.) Pickling mixes usually have a lot of salt in them; try it with less next time so it is more to your taste. I just wanted to say that these pickles are my favorite thing to make right now. In fact, I’m making them for dinner for the fourth or fifth time tonight. Great recipe! Tried this one out tonight, I pickled some pointed cabbage along with the red onion, added a bit extra tabasco, and served the pickled cabbage & onions with plain yoghurt to cool the bite from the tabasco, what an excellent combination! Thank you for the inspiration! That salad looks fantastic. Sounds like it would be great with Thomas Keller’s fried chicken, which in my opinion needs something killer with it so the side is as good as the chicken! Oh, wait. Anne Burell was the chef at Gusto???? Have you ever eaten the meatballs there???? Total, insane, lick-your-plate, I keep trying to duplicate them but never succeed delish. Mmm…just made this, but with marcona almonds, manchego, and basil, and I added some couscous. SO good. definitely a keeper. love the idea of making this with Thomas Keller’s fried chicken–that’s been a recent obsession of mine, but I use the buttermilk brine from here for it! i first made the pickled onions for the mediterranean pepper salad/dressing (which i make all the time and eat almost all of by myself!) and my boyfriend discovered a few rogue bits in the juice left over on the counter. he is the one who drinks the pickle juice out of the jar, and who i have to hide the worcestershire sauce from because otherwise i catch him taking swigs out of it and then there’s no more to use for cooking. keep up the good work, we love your recipes and the fact that you always answer questions in the comments! OK, Deb, clearly I’ve discovered you’re wonderful space here far too late, because I made this exact plate tonight, and all I can do is sit with my head in my hands wondering where pickled red onions and raw escarole have been all these twenty-eight years. Doing it, of course, with a hugely contented smile on my face. Though I guess thanks should also go to Ann Burrell (who I’ve kind of come to adore a little), but I never saw that episode, so I’m going to give it all to you. And after a day, by the by, I’ve become pretty obsessed with your site. While I spent a ridiculously embarassing amount of time today making Martha Stewart’s blueberry pie, I have feeling that it’s just going to have to continue waiting on my kitchen counter while I jump into your raspberry buttermilk cake. In any event, thanks for such a great site. I can’t wait to explore a whole lot more – and I’ve already got the vegetables lined up for giardiniera this weekend. again with the perfect browning? How do you manage it? My fried anything is never that beautiful. Ugh. Cotoletta alla Milanese with chicken is still good..but once you’ve had the original with veal you’ll never go back! you have such wonderful recipes! Do you have any tips on how to deep fry properly? For the life of me I never can get a good coating no matter the instructions I follow. 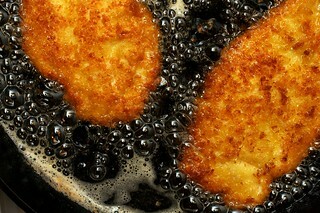 Any links to a decent deep fryer or trouble shooting deep frying for dummies? Thanks for all you do love the site! I made the picked onions…delish! Although I never make deep fried food, I “bit the bullet” and decided to make this recipe. And am I glad I did! This dish was fantastic! I substituted romaine for escarole and added shaved parmeggiano Reggiano, avocado and Vidalia onion.The mustard dressing was delicious. A 10/10 for me!! I grew up with eating escarole salad. My Mom would make the salad with the tender inside leaves in the heart of the escarole and use the outer leaves for cooked greens at another time. At the time I wasn’t crazy about it. I would have liked to have iceberg lettuce like everyone else. But in later years, I have come to appreciate a good escarole salad. I love the idea of pickled onions. Will be making this recipe tonight and am looking forward to it. I found this post after reading about bee sting cake. This salad sounds delightful! One question: We are not fond of hazelnuts in our household, so I was wondering if you might have a suggestion for a substitute? I love this. Escarole always makes think of Nana (she always put it in her chicken soup), and I’m obsessed with the pickled onions. I want to try adding fennel or maybe radishes with the onions next. Made this last night exactly as written and it was wonderful. Hardest part was not nibbling on the hazelnuts, parsley and romano combination before it went into the salad. The salad was amazing (omg the onions) and the chicken outstanding. Don’t forget to add the salt to the cooked chicken, it really makes a difference. This was supper tonight and it was just the thing. No escarole to be found in this little mountain town, so substituted a crispy combination of romaine and young mixed greens. The flavours in the salad were wonderful- hazelnuts shone through. My boyfriend died for the pickled onions and the perfect contrast between their brine and the nice salty fatty crisp chicken coating. Thanks for the recipes! I just made the chicken, but it was great. The kids loved it! And we loved it again! Thank you! The kids like the chicken plain. We enjoyed in a salad with my ranch dressing. This looks really good but I’m just wondering. I always hear to never cook with extra-virgin olive oil, or never even use it at hot temperatures. Won’t it burn/get bitter or lose its flavor if I use it to fry the chicken it? Mariam — I did not find that to be the case and I wasn’t using a very fancy one. If you’re nervous, you can always half-half it with a more neutral cooking oil. A note about easier cleanup. I use two sheets of waxed paper and overlap them. I put both the flour and the panko/cheese mixture in piles on top of them, dredge the chicken and then roll up the waxed paper and put throw it all away. No dishes! Made the salad tonight and it was a hit with my escarole-hating husband! I didn’t use the nuts, though (didn’t have any). Instead I browned some breadcrumbs in a pan with a bit of olive oil and mixed them with the cheese and parsley by hand. Turned out great, though of course the flavor is a bit different. I thought I’d share since a few people had asked for a no-nut option. Could you please clarify “chicken breasts”? I know it sounds silly, but what’s often sold is actually half a breast instead of a whole breast (both sides). Annette — Good point. I meant boneless skinless breasts. Will clarify. Finding this recipe today is one of the many reasons I love this site! The “surprise me!” button never fails me. I am in the biggest dinner-idea rut and I think we’ll all love this one. Thanks again for such great recipes. I cooked the version of this dish you have in your cookbook last night. Delicious! Also a fun cooking process – I very much appreciated the tip of keeping the cutlets warm in the oven while frying the others, as I have had that problem in the past and didn’t know what to do about it. Do you have any tips for how to avoid oil splattering all over your stove? I have a splatter screen but it doesn’t seem to help as much as I would like. Brendan — Definitely the splatter screen is your best bet. Splattering comes from moisture so well-patted-dry chicken and also chicken closer to room temperature will splatter less, but I still would use a screen. I make something very similar with two differences: Baked instead of fried, and I marinate the chicken in buttermilk before breading. It lends a really delightful flavor. Ooooooooooh yum! Thanks a lot for reposting this on a Friday in Lent! I’ll have to make this soon, though, because now I won’t stop thinking about it. So glad you posted this recipe to FB a while back. Just made it for dinner and it was amazing. I subbed the escarole for spinach and we ended up piling the onions on the chicken because I was rushing and hadn’t looked at the pics or read through the recipe all the way (one year old was loosing patience with me in the kitchen). Perfect recipe, perfect dinner, thank you! Made this tonight with a few changes and substitutions because blah blah blah and oh! my! god! so delicious. One of the best meals I’ve made for myself in a long time. Thank you! So, can we talk about these pickled onions? Because oh. My. God. I’m really glad I don’t have to live without a batch in my refrigerator anymore. BLTS .. Better with pickled onions. Nachos .. Better. Tacos .. Better. Grilled cheese, salads, cardboard boxes ..
Deb, do you ever use the leftover pickling liquid in salad dressing once the divine onions are gone? Maggie — Absolutely. In fact, you’re supposed to here and I think it’s just good practice in general — it’s already salty and a little more flavored than most vinegars. I have found myself adding those onions to all kinds of things as well. Great with avocado…. the pickling ratio is poifect. My family would be thrilled if I made them this. I would be too come to think….. I find a rolling pin to be a good thwacker btw. Oh and I will vote for you too! Thanks for so much inspiration! I always use the extra breadcrumbs and egg to make a “bread patty”, which I fry up last and immediately snack on. Made this for Saturday lunch. Oh my heavens! Chicken was aaaammaaazing! I’m earning mega love points with my family, thanks to your recipes. Thanks Deb! Just made this for dinner tonight and it was delicious (and easy!) love the pickled red onions and the escarole salad combo. Also love Anne Burrell. She’s so no nonsense and her food always looks amazing. Love your site too – havent made a recipe of yours yet that’s disappointed me. It was a hit with everyone, including two very picky elementary school aged girls. I couldn’t find escarole, so I substituted with frisee. It will go on my regular monthly rotation! Well that was delicious! My husband was so impressed he opened wine. Didn’t we live large tonight! Thanks again, Deb. The escarole salad is incredible -so good that I now keep a jar of pickled onions and the ground hazelnut-romano-parsley mix in the fridge to use on my other salads. Great if you add some roasted chicken breast, as well. This recipe was delicious. I forgot to put the cheese for the chicken, but it didn’t need it if you use Italian seasoned breadcrumbs. I used breadcrumbs and panko combined. The escarole salad made the dish in my opinion. Instead of hazelnuts, I toasted walnuts, used 1 cup of pecorino. I cut up the escarole, which had that nice bitter flavor, added 2/3 of the almond/parsley/cheese mix, and then added about 3-4 TBSP of olive oil and the liquid from the pickled red onions. 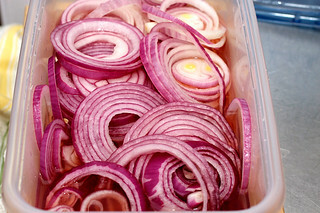 Make the red onions. I tossed it together, put it on top of the chicken in a platter, and garnished with some extra cheese. It was FANTASTIC. There were no leftovers. thank you for this wonderful recipe. It will definitely be one of my go tos for dinner parties! Correction – I used almonds! Got walnuts on my mind apparently. Wow! I really wasn’t expecting to be blown away as much as I was by this recipe-but honestly, it was, to me, a perfect meal! The chicken-simple, but crispy and juicy. The real winner here is the salad. I don’t love salad-I don’t think I’d even eaten escarole before-but I ate two large helpings of that salad! It was so delicious! The meal feels balanced, and, dare I say, healthy? I will most definitely be making this again…and again, and-you get the idea. Thanks Deb! I love it when I get to comment on a 9 year old recipe, just a few months younger than my son! :) I made this for a few friends last night and I’ve never seen anyone eat so fast. It was a hit! I loved both the chicken and the salad, but its the salad that will go into heavy rotation for sure. I’m making it again tonight to go with my NYE dinner. Thanks as always! This salad is AMAZING! So much umami. Am going to keep making it again and again! I make this dish, particularly the salad, all the time. It’s always a hit, and is quick enough for weeknight cooking. I often forget the parsley and, due to an initial clerical error, make it with curly endive. If I don’t have hazelnuts, I use walnuts instead. Always great.